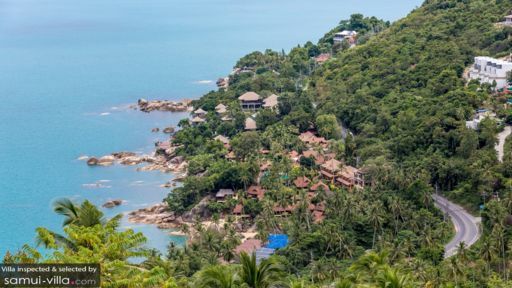 Found overlooking Chaweng bay in Koh Samui, Villa BelAir is a serene four-bedroom holiday home with splendid views, comfortable modern living, and hints of traditional Thai architecture. Perfect for families, groups of friends, and even corporate getaways, the villa is ideally suited for any kind of gathering as it extends ample amenities and facilities to its guests. An infinity pool with expansive views, BBQ facilities outdoors, and alfresco lounge for viewing the stunning sky, make your holiday even better! There are four bedrooms at Villa BelAir, each is air-conditioned and furnished with a king-sized bed with ample wardrobe storage for all your belongings. The bedrooms are whitewashed and feature comfortable beddings with quality linen, to complement these neutral tones you will find vibrant artwork on the walls. Each of these leads to a private balcony that not only serves as a pleasant escape from the indoors but also proves to be a stunning point from where you can view the ocean! There are en-suite bathroom accompanying all four bedrooms at the villa fitted with necessary amenities, showers, etc. 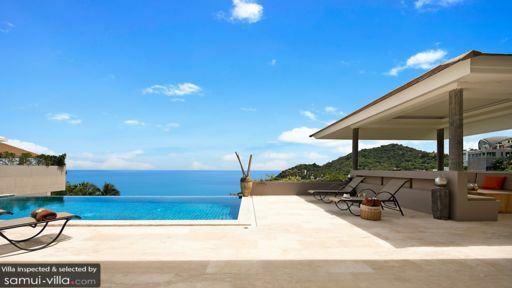 The star of the villa is its infinity swimming pool where you can experience living on the edge while also relishing the breathtaking ocean view which is undeterred and unobstructed. There are sun chairs you can relax on and take a nap for good measure under the tropical sun or you can head to the Thai sala. There is BBQ available to guests so you can get a taste of freshly-grilled food while the calm and serenity of your surroundings enhance your experience. If you wish, you can even rest on the beanbags placed on the sun deck! 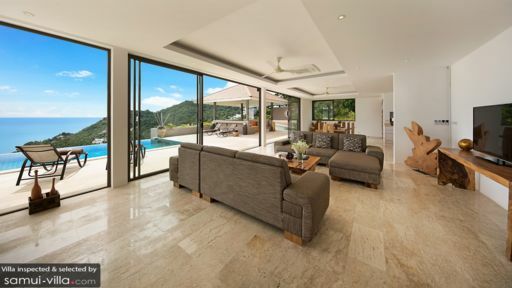 A poolside living area has been designed with minimal furnishings and interiors to amplify the natural beauty of the outdoors that can be observed at all times through the glass doors that slide open to the pool deck. You will be struck by the splendidly blue skies and waters that are visible right from the comfort of your own home! Furnished with comfortable earth-tone couches and sectional sofas, the living area is great for when you wish to retire at the end of the day for some drinks and appetisers with friends and family. The living room has been decorated with a miniature sleeping Buddha statue, local artwork, tribal wooden pieces, and plenty more. Each is intriguing and distinct adding to the understated and contemporary character of the room. The eight-seater dining table has been carved out of a single slab of wood with natural wood fibres visible after a polish. An open kitchen which has been fully-equipped with modern amenities offers a coffee machine for your morning fix, electric kettle, microwave/oven, refrigerator, etc. From welcoming you open arms to helping you get settled in, the staff at Villa BelAir is generous and extremely friendly towards guests. There are concierge services available so you can play your days with professional assistance. Enjoy a Thai massage at the villa at an extra charge and employ the services of a professional chef to relish delicious local and international cuisines. The villa sits overlooking the popular Chaweng Bay with its bustling shores that sees a lot of travellers heading to the beachside restaurants, bars, and other attractions. Enjoy the tropical weather while walking alongside the ocean on the sandy beaches. Take a safari into the wild to meet some wildlife and enter unexplored territories.